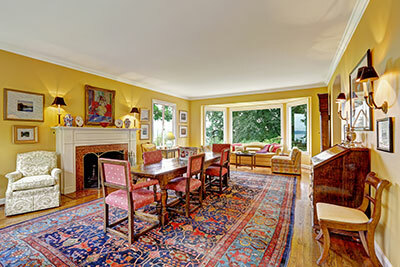 Palm Beach Oriental Rug Cleaning Pros know everything there is to know about cleaning Oriental rugs. That’s why our clients who need Oriental rug Cleaning in Tequesta, Florida choose the Pros most often! We are experts in the Oriental rug cleaning business, and we know things that most individuals (and some companies) don’t! ‘Oriental’ is a broad term and is not the same thing as a ‘Persian’ rug, which is specifically made in Iran (formerly Persia). These rugs are always handmade and can display the culture of an entire land. Both are beautiful examples of expert craftsmanship that deserve the utmost care. ‘Oriental style’ or ‘Persian design’ are both code words for rugs that are not handmade. These rugs are knotted by machines, not human hands. While these kinds of rugs can still be very beautiful, we have to know the difference, since our cleaning techniques for handmade versus machine made rugs are different. Authentic Oriental rugs will only increase in value over time, so you must take the best possible care of them to maintain their value. This means regular vacuuming, spot cleaning when necessary, and professional cleanings once or twice a year. The professionals at Palm Beach Oriental Rug Cleaning Pros can give you even more tips and advice on how to preserve your rug. That’s where we come in! 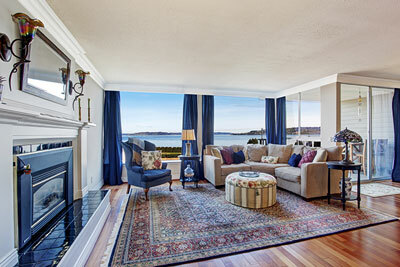 We know that your Oriental rug is a prized possession that you’d like to keep looking pristine for a long, long time. Yet you probably actually LIVE in your home, which means your rug is exposed to dust, dirt and foot traffic daily. It’s possible for a rug that is displayed in your home each and every day to still be in excellent condition. We offer competitive pricing for top-of-the-line services. We never try to save a buck at the risk of damaging your valuable rug, but we’ll always charge our customers reasonable prices. We check and double check all the details about your rug before we ever start the cleaning process. We’ll read the label and do all the necessary research so that we know what kinds of fibers were used, what dyes were used, and how tightly woven your rug is. These are all factors that will determine how we clean your Oriental rug. We clean Oriental rugs thoroughly so that all the dirt and stains are removed, but we go one step further, deep cleaning so that all the dust particles and allergens are removed, too. Rugs, carpeting and upholstery are magnets for these particles that can make you and your family sick! We’ll come out to your home or office in Tequesta and take a look at your Oriental rug. There’s no substitute for examining the rug in person to give you the most accurate quote for our cleaning service. After that, we’ll leave it up to you to decide with absolutely NO PRESSURE from us. Many people consider cleaning their Oriental rug themselves because they are sure it will be cheaper than calling out a professional. That may be true initially, but you’re taking a huge risk that nothing will go wrong. Cleaning your Oriental rug yourself could result in soap residue being left behind in the organic fibers. You’d think that would leave your rug looking and smelling great for a while, but it will actually attract more dirt and dust. You have to be sure to rinse out every bit of leftover soap from the rug for the best and longest lasting results. If you choose the wrong store-bought cleaner, you could discolor or fade your Oriental rug as well. This is damage that, unfortunately, cannot be undone. When you call the professionals at Palm Beach Oriental Rug Cleaning Pros, you can be sure that this isn’t a risk you’re taking! Also, those rental carpet cleaners are designed for durable carpets, not delicate rugs. They can damage your rug, and they can also leave a big mess behind, since their powerful jets are used to shooting water through to the carpet backing and sub-flooring. The first thing that will happen is that you’ll talk to one of our knowledgeable Oriental rug cleaning experts about the work that you want done. During this phone call, you can ask all the questions you want about our services, products and prices – but we won’t be able to tell you anything for certain until we’ve checked out your rug for ourselves. Next, we will come to your home and evaluate your Oriental rug to determine our best course of action. We cover the entire Tequesta area, so don’t worry that you’ll be out of our service area. We’ll include you every step of the way so you know what we’re going to do, how we’re going to do it, and when! Finally, you will need to schedule a good time for us to come pick the rug up to professionally clean it. We clean Oriental rugs in our facility rather than in your home so that we can ensure all of the dust and dirt we remove from the rug is not released back into your home. Plus, we know how inconvenient it can be to have workers around your house if you work or have small children. We’ll deliver your rug back to you, good as new, in 7 to 10 days. With 28 years of experience cleaning all types of Oriental rugs, Palm Beach Oriental Rug Cleaning Pros really is Tequesta, Florida’s best choice for all of its rug cleaning needs. You shouldn’t trust such an expensive, exquisite item to anyone besides a trusted and trained professional. Our longstanding relationship with Tequesta residents (and surrounding areas as well) proves that our customers are pleased with their results!